Rheumatoid arthritis is a common condition in which the body’s immune system will mistakenly attack the joints and cause the tissue lining the joint to become thicker, swollen, and painful. Over time, this swelling can damage the cartilage in your joints and cause deformity to occur. Since rheumatoid arthritis causes cartilage loss, the bones themselves can become damaged as the joint becomes unstable, loose, and stiffer. Over 1.5 million Americans suffer from rheumatoid arthritis, with women being more heavily affected by this disease than men. Rheumatoid arthritis can occur in your hands, wrists, elbows, knees, ankles, and feet. Unfortunately, rheumatoid arthritis affects joints symmetrically, meaning that it is likely for both of your wrists to become afflicted rather than just one. The onset of this disease typically begins between the ages of 30 and 60 years old. 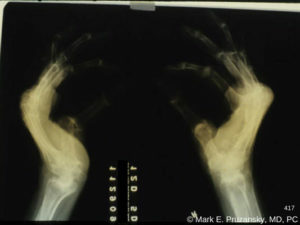 However, some individuals can develop juvenile rheumatoid arthritis. Like many diseases, having a family history of rheumatoid arthritis increases the likelihood that an individual will also develop the disease. However, many people with rheumatoid arthritis have no known family history of the disease. Although broken bones and other structural damage to your joints can lead to an increased likelihood of developing osteoarthritis, these are not factors that contribute to the onset of rheumatoid arthritis. However, because rheumatoid arthritis is an autoimmune disease that attacks the joints, it can lead to bones breaking more easily due to their instability. Rheumatoid arthritis can cause ancillary problems like carpal tunnel syndrome or tendon rupture, making it even more imperative to seek treatment early. The onset of rheumatoid arthritis is not connected to overuse of your joints. Other autoimmune rheumatic conditions could contribute to rheumatoid arthritis developing, and they may even share similar symptoms. Lupus, for example, is a chronic condition that frequently is confused for rheumatoid arthritis in the early stages of diagnosis. However, only a very small percentage of individuals with lupus also have rheumatoid arthritis. Why Do My Joints Hurt? 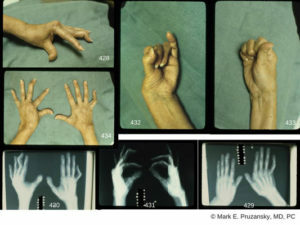 Could It Be Rheumatoid Arthritis? Joint pain is a common symptom experienced by individuals as they get older or following an injury. Many infectious and different types of autoimmune disorders exist. However, any joint pain is a cause for concern. If you experience the sudden onset of joint pain, stiffness in your joints, symmetrical joint pain, or have noticed deformities in your joints, please see an orthopedic specialist as soon as possible. When rheumatoid arthritis is caught early, patients have a better opportunity to manage their symptoms and the extent to which the disease is able to damage their joints. Rheumatoid arthritis, unlike osteoarthritis, is caused by an autoimmune disease that causes your body’s immune system to mistakenly attack your joints. Many lifestyle choices, like playing contact sports, typing a lot, or having to do repetitive movements, have not been connected with the onset of rheumatoid arthritis. Family history is another indicator of your likelihood of developing rheumatoid arthritis. People who have an immediate family member who has developed rheumatoid arthritis are up to four times more likely to develop the disease themselves. Alleviating your joint pain requires that you see a professional to accurately diagnose the cause of your pain and develop a treatment plan to correct the condition. At Handsport Surgery Institute, surgery is the last option and we prefer to work closely with patients through different treatment options, like physical therapy or steroid injections. Surgery is the last option. We prefer to work closely with patients for different treatment options, like physical therapy and occupational therapy, or steroid injections, before surgery becomes an option. A rheumatologist’s exam is essential. They are an important part of the team. The earlier you are seen for your joint pain and rheumatoid arthritis, the less likely it is that you’ll need surgery to alleviate your symptoms. Whether you’re experiencing sudden wrist pain or have been living with slight discomfort, it is important to be seen by a professional to be able to accurately understand and treat the cause of your pain. With over 40 years of combined experience, Dr. Mark Pruzansky and Dr. Jason Pruzansky are able to treat all forms of joint pain and provide patients with treatment options to alleviate symptoms of rheumatoid arthritis. Because of their level of expertise and specialization, Dr. Mark Pruzansky and Dr. Jason Pruzansky have successfully performed surgery on some of the most complex injuries and conditions to help their patients regain function and comfort following instances of joint pain or injury. 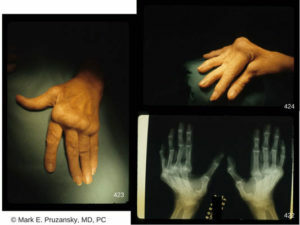 Although there is no cure for rheumatoid arthritis, many patients can diminish their symptoms and pain by seeking treatment with an orthopedic hand surgeon, who may use treatments such as occupational and physical therapy, NSAIDs (nonsteroidal anti-inflammatory drugs), corticosteroid injections, consider the prescription of drugs to slow the disease activity, such as DMARDs (disease modifying anti-rheumatologic drugs) and JAK (Janus kinase) inhibitors, and corticosteroids. Based on your individual circumstance, your HandSport Surgery Institute team will be able to determine the best non-surgical treatment available to you. At HandSport Surgery Institute, surgery is never the first option that we explore to treat patients. Many individuals suffering from rheumatoid arthritis will never need surgery to manage their disease, but some surgeries may be beneficial depending on the severity of your disease. For more information on the options available for you to alleviate your joint pain or rheumatoid arthritis symptoms, please schedule an appointment with HandSport Surgery Institute. Please contact us as soon as possible to schedule an appointment with our talented team. Rheumatoid arthritis and joint pain can be treated, but early diagnosis is helpful to reduce the risk of diseases or injuries developing further. Call Dr. Pruzansky at 212-249-8700 to schedule an appointment, obtain an accurate diagnosis, and start to improve the function of your hand.